Instant Help Publications, 9781626251489, 232pp. Being a teen girl isn't easy--so learning skills to feel confident is key In Express Yourself, psychotherapist Emily Roberts will teach you how to communicate effectively and feel assertive in any situation. Whether it's online or at school, with friends, parents, bullies, cliques or crushes--any tricky situation life throws yours way. Many teen girls feel pressured to be nice, rather than assert their opinions. They may fear being called bossy or pushy when speaking their mind or offering a different point of view. If you have ever stopped yourself from expressing your opinion, you know how bad it can feel afterward. Don't let yourself fall into that same trap over and over. Your thoughts and feelings matter just as much as everyone else's--you just need to find your voice. Express Yourself offers skills based in dialectical behavior therapy (DBT) and cognitive behavioral therapy (CBT) to help you create positive interactions with others and deal with difficult emotions that can arise from bullying or dealing with mean girls. The book also provides easy-to-use strategies that will boost your self-esteem and confidence, and you'll discover tons of assertive communication skills you can use every day, including how to speak up when you are upset, asking for what you want in a clear assertive manner, and coping when intense emotions threaten to take over and sabotage your relationships. Emily Roberts, MA, LPC, is not your average psychotherapist. She splits her time between working in New York City and Austin, Texas. She has positioned herself as both a mental health expert and liaison between girls and their parents, with an emphasis on healthy and effective communication skills. She created The Guidance Girl as a brand to help girls, women, and parents feel confident and gain the skills they need to live happy and healthy lives. Emily is aware of the challenges faced by both teens and women, and has built a practice by positioning herself as therapeutic mentor and consultant. Emily is a media contributor and is a regular guest on HLN's Dr. Drew on Call, educational speaker, author of several blogs and articles including HealthyPlace.com's Building Self-Esteem Neurogistics Corporation. You will find Emily leading groups for girls as young as five and as old as 40, as well as parents and educators on topics including: technology, self-esteem, trauma, dialectical behavior therapy skills (DBT), confidence, leadership, friendship skills, and stress reduction activities with an emphasis on creating healthy boundaries with technology. 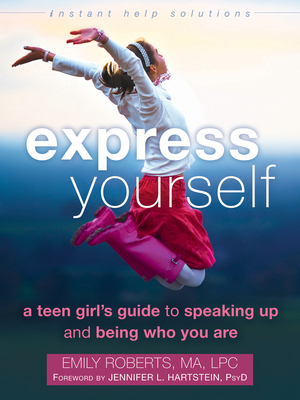 Roberts' book, Express Yourself, is winner of a Foreword Reviews' 2015 INDIEFAB Book of the Year Award for Young Adult Nonfiction. Foreword writer Jennifer L. Hartstein, PsyD, is the owner of Hartstein Psychological Services, a group psychotherapy practice in New York, NY. Hartstein works with children, adolescents, and families with a wide range of psychological diagnoses, and specializes in the treatment of high-risk children and adolescents. She has received intensive training in adolescent suicide assessment, and has specialized in this population for several years, using a variety of treatment approaches, including dialectical behavior therapy (DBT). She is on the advisory board for MTV's A Thin Line, which focuses on the digital behaviors of today's young people. Additionally, she is a psychological contributor for NBC's Today Show, as well as other national news outlets. Hartstein is author of Princess Recovery: A How-To Guide to Raising Strong, Empowered Girls Who Can Create Their Own Happily Ever Afters.